This column is a lead commentary in the VoxEU Debate "Euro Area Reform "
A team of prominent French and German economists have presented a paper which they regard as “a game changer for the euro area” (Benassy-Quéré et al. 2018). Their proposals have initiated an intensive debate (Bini Smaghi 2018, Micossi 2018, Buti et al. 2018, Pisani-.Ferry and Zettelmeyer 2018). While several shortcomings of CEPR Policy Insight 91 have already been discussed, in this column I argue that the specific insolvency risk of euro area membership is the main risk that should be covered by a joint risk sharing. The authors' modest proposals for a public and private risk sharing are insufficient in this regard. With a strengthening of market discipline, this risk could even be increased. So far, there is little evidence that financial markets could play a stabilising role in the euro area. The proposal for an expenditure rule has its merits as it focuses on a target which governments can control effectively. But it requires a sensible debt-to-GDP target, for which the completely arbitrary 60% value of the Maastricht Treaty should not be slavishly adopted. For a productive compromise between France and Germany, the German side has to take the first step by allowing at least some debt financing of public investments within the fiscal framework of the euro area. Given the focus on ‘risk sharing’, it is surprising that the authors do not explicitly explain what specific risks they want to be shared. Their proposals focus on the risk of idiosyncratic demand shocks and the risk of a national banking crisis. But this neglects the unique and existential risk of euro area membership. Monetary union exposes its member states to an insolvency risk which is absent for similar countries which have a national currency. When a country adopts the euro, its debt is redenominated from the national currency into the euro. Thus, member states are in a similar situation as emerging market economies which can only lend in a foreign currency (‘original sin’). In a crisis they can no longer rely on the support of their national central bank. This specific risk is aggravated by an easy exit option that the single currency provides for investors. If, for example, a Japanese pension fund is no longer willing to hold Japanese government bonds and decides to hold US treasuries instead, it is confronted with a currency risk. For institutional investors that are required to hold safe assets, this ‘currency wall’ is difficult to surmount. Within the euro area this wall has been removed so that investors can exchange domestic bonds into bonds of other member states without an exchange rate risk. The combination of the insolvency risk with the easy exit option leads to a denomination risk (Bini Smaghi 2018) which has manifested itself in the euro crisis. Only with Mario Draghi’s commitment to save the euro “whatever it takes”, which was regarded as an implicit insurance against this risk, could the stability of the euro area be maintained. It is important to note that this risk is not due to “a poorly designed fiscal and financial architecture”, as Benassy-Quéré et al. see it. It is due to the fact that the monetary union is a building which is not yet finished. It would require more political integration to become a stable building. Above all, Germany must have a strong interest in the integrity of the euro area. The euro has protected German manufacturing against exchange rate shocks vis-à-vis the other member states. One can also assume that the Deutsche Mark would have been a stronger currency than the euro, so that the protection has also been effective vis-à-vis other countries. Thus, one should expect that a proposal by German and French economists for ‘risk sharing’ would address this risk. But as the Policy Insight not even mention it, proposals for such risk sharing (Delpla and von Weizsäcker 2010, German Council of Economic Experts 2011) are also not discussed. The proposal for a European Deposit Insurance Scheme (EDIS) envisages insurance premiums which are pricing country-specific risks. It also requires that first losses should be borne by the relevant national compartment. Common funds should be provided only “in large, systemic crises which overburden one or several national compartments”. But in such a situation, the risk sharing provided by the EDIS (with a target size of 0.8% of covered deposits of participating banking systems) would soon reach its limits. An insurance scheme is effective only if risks are uncorrelated. In ‘large, systemic crises’ risks are correlated, and the scheme breaks down. Thus, only the ECB as lender of last resort would be able to stabilise the system effectively. The second proposal envisages a European fiscal capacity for “large downturns affecting one or several member states”. The authors compare it to a “’catastrophic loss insurance”. With total annual contributions of 0.1 % of euro area GDP, the size of the fund is limited as a borrowing possibility is explicitly excluded. As a result, even in a severe recession a country would receive rather limited transfers. For an increase of the national unemployment rate by 4 percentage points, a one-time transfer of only 0.5 % of national GDP is envisaged. But this makes a country only better off if it is hit by the shock within the first five years of the existence of the fund. In addition, due to the limited size of the fund the shock must not affect too many member states simultaneously. As a specific hurdle, access to the fund requires that a member state complies not only with the fiscal rules but also with the country-specific recommendations. In a situation with a very large shock, this is very unlikely. And for such an ideal country it should be possible to finance a temporary cyclical deficit on the capital market without major problems. Both forms of risk sharing resemble the idea of establishing a fire brigade which can only be activated in the case of huge fires. But at the same it is designed with such limited capacities that it will never be able to deal with such fires. Benassy-Quéré et al. propose market risk sharing as another stabilising factor. One element is the completion of the Banking and Capital Market Union: “Euro area citizens and corporations should be able to hold their savings in instruments whose returns are independent of unemployment and output declines in their home country.” But this is already possible under current institutional arrangements. As already mentioned, the single currency has removed the ‘currency wall’ for portfolio investors. And it was an excessive cross-border bank lending, above all by German and French banks in in the years 2000-2007, which contributed to the crisis. More generally, it is not clear how bond and equity markets can provide significant risk sharing given the very asymmetric distribution of wealth in the member states. For households with very little or no financial wealth at all, Capital Market Union cannot provide an effective insurance for the risk of unemployment. The second element of market risk sharing is the creation of euro area safe assets (ESBies). The authors believe that a “safe asset in the euro area would create a source of demand for euro area sovereign debt that is not ‘skittish’ in the face of changes in market sentiment.” But they also admit that this is only the case “so long as sovereigns do not lose market access since this triggers exclusion from the collateral pool of new issues.” And they see the risk that “it may be difficult to find buyers for the junior tranches in time of crisis”. In other words, their scheme for market risk sharing would fail exactly in the situation when the fundamental insolvency risk of the area becomes manifest. Market discipline: Governments under the control of markets? The developments since the start of the euro have confirmed this prediction. The market reaction to the chronic lack of fiscal discipline in Greece came much delayed in the year 2010, and then the reaction was so sudden and disruptive that the system could only be saved by Marion Draghi’s intervention. More generally, it is surprising that the economists’ trust in market discipline could survive the financial crisis almost unscathed. In addition, one must ask whether ‘market discipline’ is an adequate concept for the organisation of the euro area. In the context of the banking sector it may have its merits, but in the context of the monetary union it implies that markets are assigned a disciplining role over states. This turns the traditional relationship between state and markets on its head. In the past there was a consensus among economists that markets must be under the control of the governments. Market discipline calls for governments that are under the control of markets. This concept is especially questionable as financial markets are dominated by mighty players like Goldman Sachs or Blackrock. In sum, the whole concept of stabilising the euro area by combining enhanced market discipline with homeopathic elements risk sharing is not convincing. While the elements of risk sharing do not address the euro area’s most fundamental risk of insolvency, the strengthening of market discipline has the potential to even increase this risk. The authors are aware of this problem, but they regard it as a transition problem only: “The main lesson is that the ‘transition problem’ – getting to a state of more effective market discipline and higher stability, without triggering a crisis on the way – needs to be firmly recognised and addressed in proposals to raise market discipline”. But how should the transition be managed? The authors propose that the new regime should be introduced “at a time when the debts of all euro area countries that depend on market access – particularly those of high debt countries – are widely expected to be sustainable with high probability […]”. As such a situation is very unlikely for the foreseeable future, this looks much like an escape clause for the French economists. A third element of the report is a new framework for fiscal policy. The proposal is based on the assessment that the fiscal rules “have not worked well”. While this is true for Greece, which published incorrect statistics, for the large member states this not so obvious. 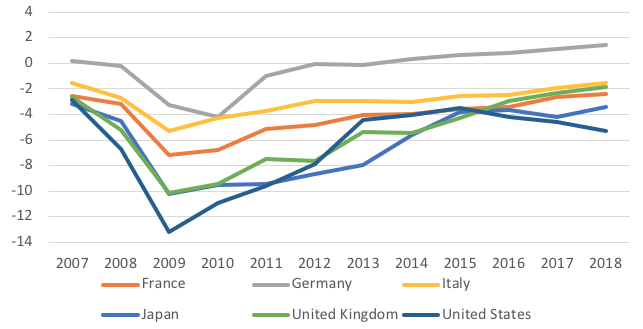 Comparing the fiscal balances of Germany, France, and Italy on the one hand and of Japan, the UK, and the US on the other, the much lower deficits of member states speak for a pronounced fiscal discipline. The authors propose a two-pillar approach with a long-term debt target “such as 60 % of GDP, or a more bespoke objective” and an expenditure-based operational rule to reach this target. For this purpose, an independent, national-level fiscal council shall be established. It shall propose a rolling medium-term debt reduction target, chart a consistent medium-term expenditure path, and use this to set a nominal expenditure ceiling for the coming year. If a country exceeds the target path all excessive spending must be financed by junior sovereign bonds. There is no doubt that expenditure rules have their merits as they are easier to follow than deficit rules. But it is not clear why the rule should be set by an expert council and not by an elected government or parliament. Economists have ideological biases which influence the judgements that must be made given the limitations of the science of economics. Thus, the nomination of specific experts for the council has a strong influence on the outcome of the debt target and the corresponding expenditure path. "[E]xplicitly describing the available evidence that pertains to a policy and tying the policy to evidence. Consciously anchoring a policy, not to current practices or the beliefs of experts, but to experimental evidence. The policy must be consistent with and supported by evidence. The pertinent evidence must be identified, described, and analysed. The policymakers must determine whether the policy is justified by the evidence." The Maastricht 60% target is obviously based on current practices and beliefs of experts and it lacks any pertinent evidence (for example, in the UK the long-term historical average from 1700 to 2016 is 99.5%; Figure 2). Thus, any strategy that tries to make the euro area more stable should entail an intensive analysis of an adequate debt target for the member states. Substituting the 60% target by a target which is closer, say, to the debt-to-GDP level of the US could fundamentally change the perception of the financial soundness of the member states. Source: Bank of England, “A millennium of macroeconomic data”. The instability of the euro area architecture is not due to a “poorly designed fiscal and financial architecture”. It reflects an unfinished building with a supranational monetary policy and 19 independent national fiscal policies. Thus, the only way to make it stable is to go ahead with political integration. This would allow a comprehensive debt mutualisation which would remove the specific insolvency risk of euro area membership. With the transfer of fiscal policy responsibilities to the supranational level, fiscal discipline of the member states would be enforced by a democratically legitimised euro area finance minister and not by myopic financial investors. In the current situation progress towards a fiscal policy integration is not very likely. But for economists this is not an excuse for not making explicit what is really required to stabilise the architecture of the euro area. For a productive Franco-German compromise, the German side must make a first step by allowing some flexibility concerning the ‘black zero’. This would allow more room for the golden rule in the Stability and Growth Pact so that at least a limited debt financing of public investments would be possible. As another step forward, one could envisage projects with large euro area externalities (infrastructure, defence, research, industrial policy, environment) which are financed by bonds with a joint liability. Finally, a thorough and open-minded analysis of the adequate targets for public debt to GDP would be very helpful. CEPR Policy Insight 91 calls for “ashift inthe euro area’s approach to reconcile fiscal prudence with demand policies, and rules with policy discretion”. But it presents a framework that limits the scope for demand policies by the introduction of fiscal rules and “sovereign concentration charges”. And it reduces the scope for national policy discretion not only by the establishment of independent fiscal councils and but also by exposing governments to more ‘market discipline’. The proposal could indeed be a “game changer”, but into the wrong direction. Bénassy-Quéré, A, M Brunnermeier, H Enderlein, E Farhi, M Fratzscher, C Fuest, P-O Gourinchas, P Martin, J Pisani-Ferry, H Rey, I Schnabel, N Véron, B Weder di Mauro, and J Zettelmeyer (2018), “Reconciling risk sharing with market discipline: A constructive approach to euro area reform ”, CEPR Policy Insight No. 91. Eddy, D (1990), “Anatomy of a Decision”, Journal of the American Medical Association 263(3). German Council of Economic Experts (2011), “European Redemption Pact”, in Annual Report 2011/12. Pisani-Ferry, J and J Zettelmeyer (2018), “Messori and Micossi’s reading of the Franco-German 7+7 paper is a misrepresentation”, CEPS Commentary, 19 February. Reinhart, C M and K S Rogoff (2010), “Growth in a Time of Debt”, American Economic Review 100(2): 573-78.